The team at Andersen Office Interiors realized that a visual representation of the work they were capable of was necessary to stand out from their competitors. A modern, sleek design paired with a mobile responsive website provided a much needed update to their site and allows them to better communicate the products and services they can provide. In business for over 40 years, Andersen Office Interiors is a family owned contract Office Furniture & Interior Design dealership with a dedicated team of local professionals. Andersen provides their services throughout the Midwest. 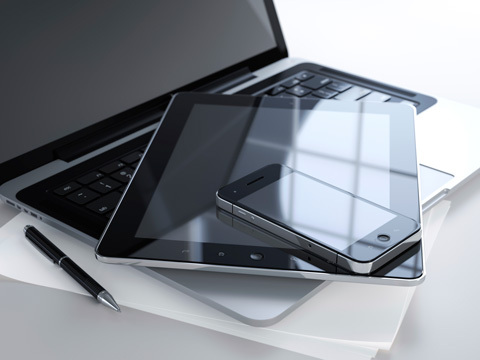 A vertically scrolling Products Page provides examples of office furniture solutions with a Contact Us button below each for ease of outreach. Co-owners Rick and Sheryl Gayeski are pleased to provide furniture from quality manufacturers, but that’s not all. Andersen Office Interiors provides Design and Space Planning along with Procurement. A member of their team will be on hand for delivery, install, and will always stand behind their products with service, maintenance, and warranty management. A blog page was implemented on the Interior Design Tab that allows them to detail stories from successful installs, to current design trends, as well as any scheduled promotions. With Facebook and Twitter tabs for social integration, they have a complete channel for distribution of stories relevant to their business. Andersen’s expertise ranges from complete commercial interior design and turnkey installation, to new trends in the industry like collaborative open architecture, sound masking and benching systems. 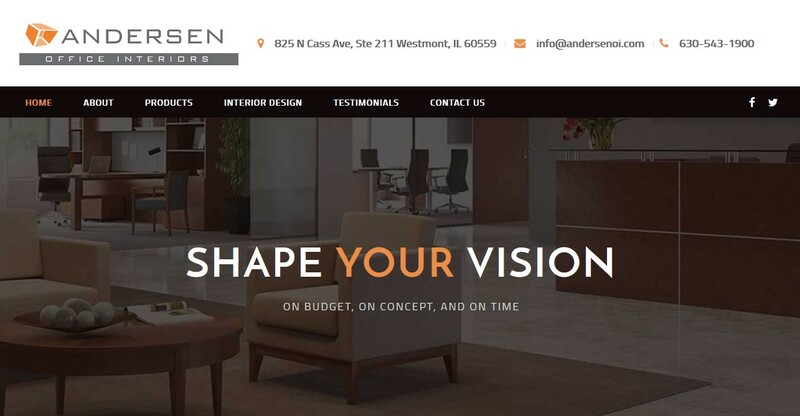 It was a pleasure working with the team at Andersen Office Interiors to upgrade their website. Integrating opportunities unearthed during keyword research allowed me to learn about another industry, from ergonomic chairs, to noise management, flooring, and architectural walls. Stylistically, there are multiple ways to present the project, with clients ranging from healthcare to manufacturing, there were a number of visual options. 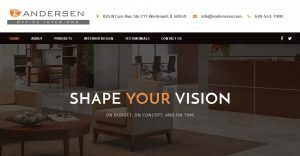 We’ve been able to provide informative insight into what Andersen Office Interiors is capable of, while delivering it in a mobile friendly format that presents well across smartphones, tablets, and personal computers.